Awesome colors of lime, aqua, and navy which I love together! The generous sponsor of a $20 gift certificate is StopAndScrap.com! I made this card for my friend to give to her step-daughter who wants to give it to her daughter to give to her grandma. The little girl's name is Emma and while she wears stylish and modern polka dotty shorts with a bow in her hair, it's easy to picture her barefoot, wearing a prairie dress with a bow in her hair, running to meet her grandma coming to town in her buck wagon. Chuck wagon. I know, I know, I said I don't like to make cards that don't fit easily into envelopes, but when I saw this sweedorable bow from Lil' Inker, I just HAD to get it. 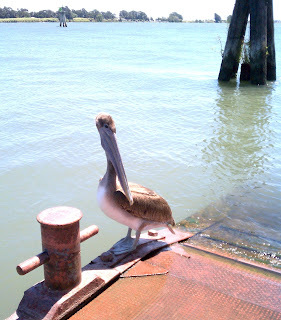 Look how close this little pelican let me come to him! Sadly, it has lost its way coming inland for food when it should be flying out over the ocean. Hope the sweet baby can figure it out soon. Enjoy your day and the Olympics, wherever you are! As always, thank you for stopping by to visit. Special thanks to you if you take the time to join as a follower or leave a comment! This technology's not as smart as it thinks it is sometimes, but it fooled me for a while. First you were there, then you weren't! Love the little girl's spotty dotty shorts to match the spotty dotty background. Beautiful bright and fun card and when it finally reaches its destination I'm sure the recipient , cant remember who it is now will love it. Great pictures that bird sure is a stunner ! Sweet card ... I agree, those colors are wonderful together. Love the polka-dot jumper - so adorable. And I like that you included all the colors in the sentiment! Lovely card Darnell and that pelican I think likes it too. Love the gorgeous picture and what an adorable card...love the sweet little girl! Thanks so much for playing with us at CAS-ual Fridays! Cute card....I bought the same bow die within minutes of seeing it for the first time on a blog post. It was so adorable. Sadly, I have yet to actually use it! She's a little cutie! Her mommy must shop at Gymboree to get those matching shoes and accessories. Love that new bow, I can see using it for so many things! I another who thinkis she's a Gymboree little one! Poor pelican...hope he gets his bearing! This little image just makes me smile! How adorable! Love that sweet pelican too...hope he finds his way! Glad to see you this week at FMS! This is just too darn cute and that sweet pelican is too. This is a fab card - I love how you tied the bow and dots into your background (and that bow is to die for! lol). Great combination of 2 challenges - trying to do that usually wears out my brain! What a sweetie! I wouldn't mind a dress like that, as long as I had bright green shoes to match too. Now whether I'd have the nerve to wear them is another matter! Fabulous job with the sketch! And she definitely looks like she could be running to meet her grandma! You did a fantastic job with the color challenge, too! Thanks for playing along with us this week at CAS-ual Fridays! What a sweet card. That little girl looks so happy. When I read the chain of custody of this card--all the hands it will pass through, I had to smile, thinking of all the people who's day your kindness will brighten. Thanks for the heads up on my PS win today, too. That was my first email of the day. Your card is darling. The crisp white bow. The cute little girl all colored so pretty. Thanks for the link to Freshly Made Sketches. I mentioned your site on my blog for the introduction. Love your Grandma card! It's DARLING!! Your craftsmanship is absolutely fabulous! I love your pelican photo, too! I always love to see the seashore creatures when I am down in FL!! Thanks so much for playing with us at CAS-ual Fridays! Sweet little girl ready to give a great big hug! I love here polka dot dress and the bow...well, I see why you had to get it! Hi Darnell! Adorable card! And that bow is awesome! Thanks for playing with us this week at Freshly Made Sketches! This card is so sweet! And I love how you incorporated the two challenges - great job! Thanks for playing along with us at FMS. Oh my gosh! This is just so clean and cute! I love the colors! Thanks for joining us at Freshly Made Sketches! What an adorably sweet card! I think I'm going to have to get that bow die. I keep seeing it everywhere! Thanks for joining us at Freshly Made Sketches! Great combination of the challenges ~ I am sure you absolutely make Emma's Grandma's day with this super sweet card!